When I found out I had to eat gluten-free I didn’t know how I would cope or even what I could eat. As I started searching gluten-free on the internet I found so many people willing to share their stories along with recipes. I want to share them with you too. Gluten-free Girl by Shauna James Ahern –read this you’ll feel much better. You’ll soon find out you’ve been given a choice to moan and groan or to enjoy the adventure of learning a new way to eat. And yes the food is good. 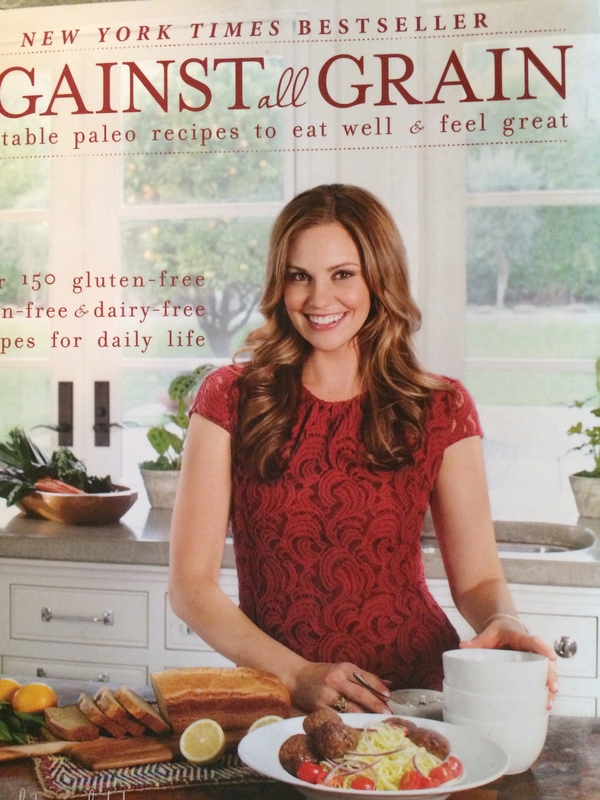 Her book is more about living gluten-free than recipes, though there are some in here. She’s writing a cookbook that should be out soon. I’ll be getting it since the recipes on her blog are delicious. The Gluten-Free Almond Flour cookbook by Elana Amsterdam-everything is yummy in this book. Real food, good food and easy to make. They use their own flour blend which they tell you how to make. Against the Grain baguettes and bagels oh my are they good! So for months—maybe years I’ve watched my husband go through pounds of raw almonds. How could he eat them like candy? Sometimes his lack of words frustrates me. I wanted to know why they are good? Why can’t you stop eating them? What is about the taste that draws you back to them consistently? He had no answers. Just that they are good. So I decided to try and discover the answers. Raw almonds like those found at Nuts.com can be found in any grocery store that has bulk bins. Warning these little gems are not inexpensive but in the name of discovery I bought more than I usually do. Understand please, that being gluten free I eat almonds in many forms. I use almond flour, almond milk, almond butter with honey on toast—oh my—it’s almost like having a doughnut for breakfast only healthy. Slivered almonds, tossed and tossed with green beans are ever so delightful. Toss in some roasted almonds in a salad and it becomes gourmet–at least in my house! Give me those delicious almonds wrapped in dark chocolate any time over a candy bar, just not a bunch because I can’t stop eating them. Almonds with salt are a perfect follow up to the dark chocolate almonds. But naked almonds? Really? Can they be as tasty? Yes, I have to admit to my husband he is right. Theyare good. But I have more words to use than he does so I can tell you they taste like pure almonds, no cover up sweetness, salt or roasted flavor. They fill me up and leave me happy and not searching for something else to snack on. They feel good in the palm of my hand. Heavy, like I’m having something to eat as opposed to those cheesy air puffed corn things I love. What’s your experience with almonds of any kind? Do you use almond flour to cook? Do you snack on almonds? Do tell in the comments. And if you, like a few of my friends are allergic to nuts I apologize for this hunger inducing post. 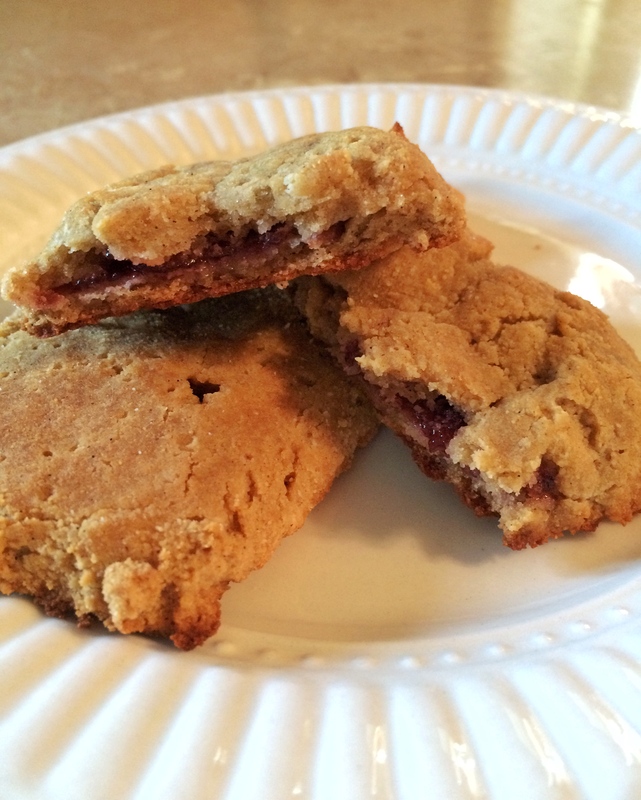 If you’re looking for recipes to use almond flour check out this post. 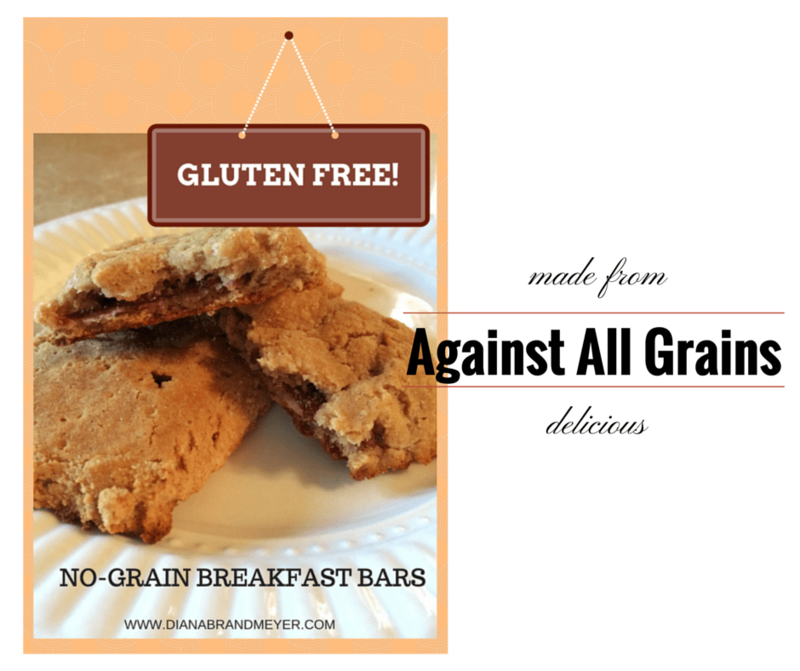 Testing and reviewing the No Grain Breakfast Bars from the Against All Grain cookbook by Danielle Walker. Is breakfast a meal you’d rather skip? If so, the Not A Grain Breakfast Bars might be perfect for you. They aren’t difficult to make, take a minimum of ingredients and freeze well. The recipe calls for blueberry preserves but I switched that out for cherry preserves. This is protein power packed breakfast with almond and coconut flours. 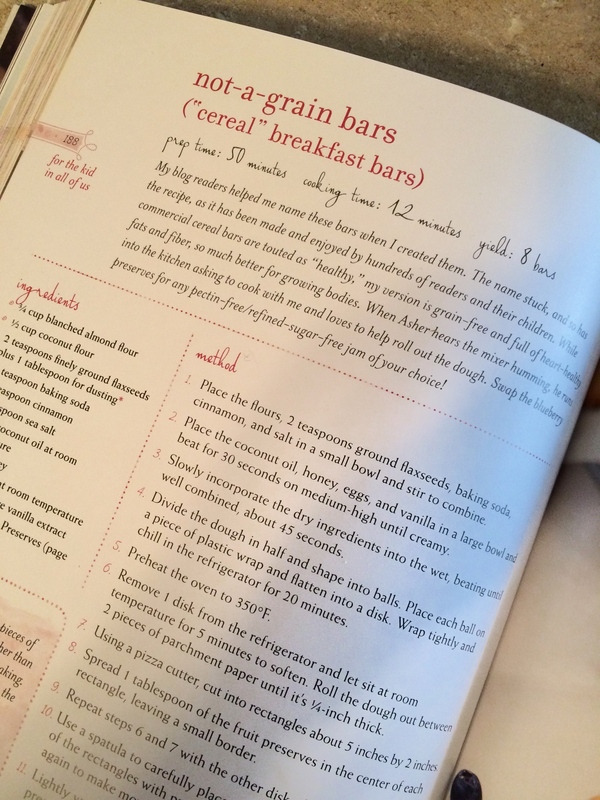 Against All Grains Cookbook doesn’t list nutritional values which is a downside for me. I’d like to know how many calories, how much protein and sugars to enter into the MyFitnessPal app. All the recipes in the book are Paleo, gluten-free and dairy free. The recipes are easy to follow and what I’ve tried so far can’t be described using the word “lacking.” Walker’s recipes make you no longer care that your food has to be made differently. If you need to eat gluten-free–even if you don’t, I’d recommend picking up this cookbook. If you aren’t ready to commit to purchasing you can find this recipe on AgainstAllGrain’s website. They came and I approached them with caution. Did I mention I am a picky eater? They looked like red raisins, didn’t smell awful so I popped one into my mouth. Then another, and another. These things are seriously good and good for you! That’s a bonus, right? They aren’t real sweet and I thought they left a warm buttery flavor on my tongue. So what kind of benefits can you get from Goji Berries? Nice skin, they are loaded with beta- carotene, they can boost your immune system and protect your eyes. They are a good source of vitamin C and can reduce cold symptoms. They also have a lot of antioxidants. But don’t eat them if you are on blood thinners or take blood pressure or diabetic medication at least that’s what WebMd says. There are also claims of weight loss, better sleeping and feeling calmer. I don’t know if those are true but if you like them why not see what happens? 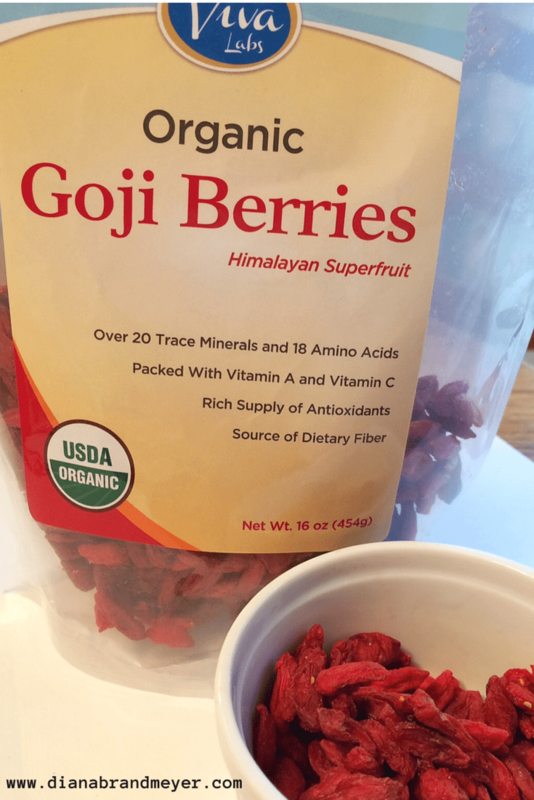 Need more information about Goji Berries? They have over 20 trace minerals and 18 amino acids, Vitamin A and Vitamin C along with a rich supply of antioxidants. Plus they are a source of dietary fiber so don’t eat a whole bunch in one day! Spicy Spinach Mac and Cheese Gluten Free –oh yes you can! I’m making this version of Spicy Spinach Mac and Cheese gluten free because I’m the only GF person at dinner. It’s so good though I’m getting mine before it is all gone. Unless I decide to double the recipe…I think that might be a wise thing to do. I have been able to find gluten free Panko at my local grocery store, but I’m sure Ian’s bread crumbs would work just as well. **Warning this stuff is addictive. Seriously, if you make this and don’t have a lot of people get your serving and FREEZE the rest. If you eat it all you’ll be working out for months. If you don’t eat gluten free you can still make Spicy Spinach Mac and Cheese. The inspiration for this dish came from The Mac + Cheese Cookbook by Allison Arevalo and Erin Wade. I’d recommend picking this book up for the clear directions–best ever for making white sauce and the variety of mac and cheese recipes. I’ve been waiting for this gluten-free bread book to be released for quite some time. It is the ULTIMATE resource for those of us with gluten issues. 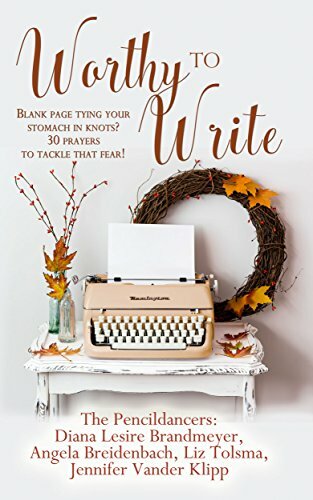 I read this book cover to cover before embarking on my first post. I learned a few things–did you know chlorine in tap water kills yeast? Me either! I started with the first bread recipe in the book, Lean Crusty White Sandwich Bread. I can’t give you the recipe, but I do encourage you to get the book if you need to eat gluten-free. It would also make a great present. Fresh From the Oven! Gluten Free Bread! This is my finished loaf. It is crusty and has small air pockets –just like that ‘other’ bread that I can’t eat. I think this cookbook should be called The Ultimate Gluten-Free Bread Book…next up on what to bake? Crescent Rolls! So what to you think? Does it look good enough to eat? Why Shouldn’t Gluten-Free People have Snickerdoodle Muffins? I saw these snickerdoodle muffins on pinterest, but they weren’t gulten-free. I had to try to make them so I could eat them. When though? Time seemed to be filled every day. Then the undesirable happened. My computer died. Well, that opened up a lot time. But we went to Michigan for a wedding. What is it about water lapping a sandy shore that instantly relaxes tension? I want to bottle that feeling so I can have some every day. Back to A2Z:M is for Muffins! 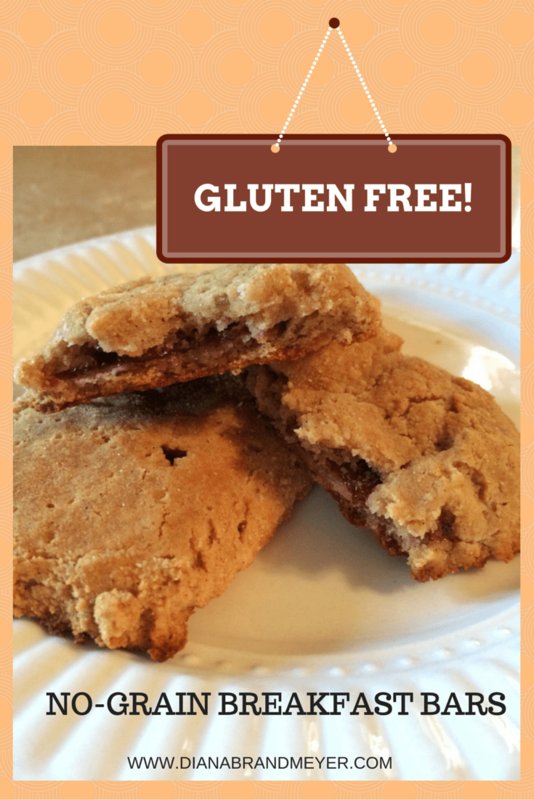 The original recipe appeared here on Eat Me I’m Delicious if you aren’t eating gluten-free head over there for the real recipe. 1. Cream the butter and sugar until soft. Add in the vanilla. Next add in one egg, mix, now add the other egg and mix. 2. In a separate shallow bowl, mix together the flour, baking soda, baking powder, cream of tartar and nutmeg. 3. 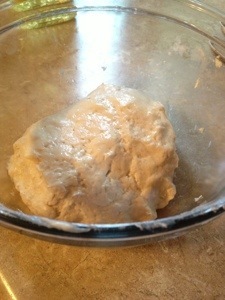 Alternately add the flour mixture and yogurt mixture to the egg-butter mixture. Start with flour and end with the flour. Scrape the bowl so you get it all. 4. Scoop about 1/4-1/2 cup of muffin batter and drop it into the a shallow bowl with the cinnamon sugar mixture. Roll the muffin until covered. Put into muffin tin. You should get about 12-14 muffins. 5. Bake about 20-22 minutes in a 350 degree oven or until pretty golden brown. These are so good even Mr. Quiet ate them. Have you ever made snickerdoodle muffins? What’s your favorite muffin? 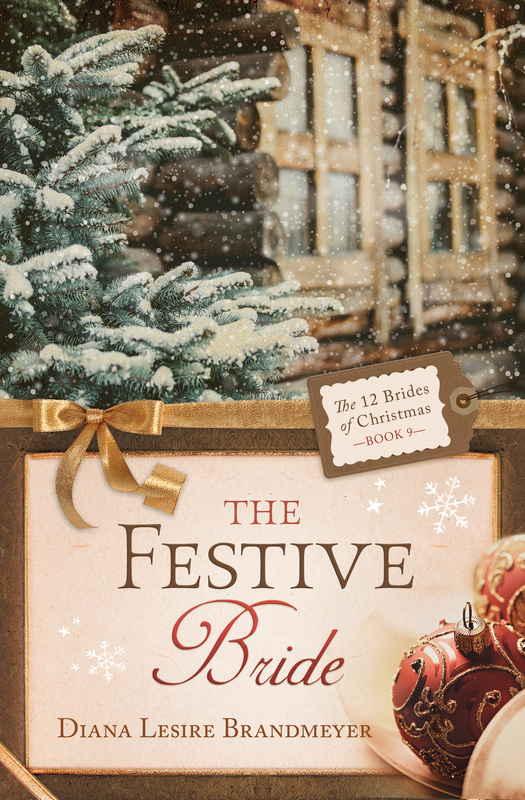 It’s a blog hop! 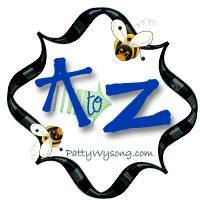 Check out what these other authors did with there a2z “M” posts. Please oh please do not use these lines–funny as they are–especially the numbers reference. I do think they might be good for a character I’m working on. Watch and tell me your favorite in the comments below. Christian Pickup Lines from T Sam Pierce on Vimeo. It’s also National Celiac Awareness Day, check out my friend Jodi Stewart’s blog today on the Top Ten Reasons to Eat at a Dedicated Gluten Free Restaurant. 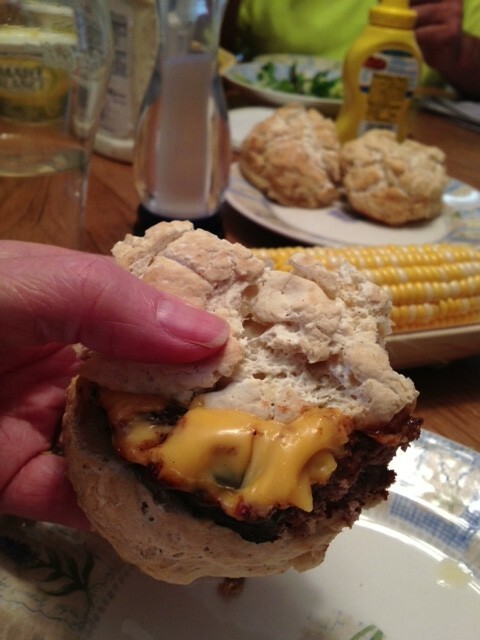 Pretzel buns, have you ever had them? I had them once at a restaurant in Nashville, Tennessee. There is nothing like a soft dough pretzel hugging a burger. That experience was filed in my mind as a ‘never again’ after I learned I had to eat a gluten-free diet. Once in a while I’d pull out that memory like an old vacation photo. I missed the bun but it didn’t bother me since I couldn’t on a whim drive to Nashville and order it. Then Wendy’s came out with their pretzel bun ads. Oh the pain, the sadness, the misery! I wanted one! I made a comment on the Gluten Free on a Shoestring site and Nicole Hunn wrote back with a solution to my desire. She has a pretzel recipe in her cookbook Gluten-Free on a Shoestring: 125 Easy Recipes for Eating Well on the Cheap and one that is a bit different on her website. I had to try it. I used the one in the book because it called for less ingredients and it makes less. Since I’m the only one on this diet in our house it made sense to try a smaller recipe. I’ll post a link at the end of this post for the recipe on-line. Due to copyright restrictions I can’t post the recipe I used. In Nichole’s new cookbook coming out in November she’s made some new discoveries on making bread. One of these was to add the dry ingredients last. It made a difference in how the dough came together. Because this was a pretzel recipe and not a bun recipe this made 3 good size pretzel buns. Slide a cheeseburger between this bun and enjoy. This bun doesn’t fall apart before you finish your meal. *note mine aren’t as pretty and brown as the one on Eating Gluten Free on a Shoestring’s site. I think it’s because I didn’t know how to make a slurry to get it browned. Should have googled it! If you don’t have to eat gluten-free search recipes for pretzel buns or soft pretzels and make your own. The benefit for me is having Pretzel Buns and not having to spend a lot of money–which I would have done if there were any out there to buy. Are you celebrating by screaming for ice cream? 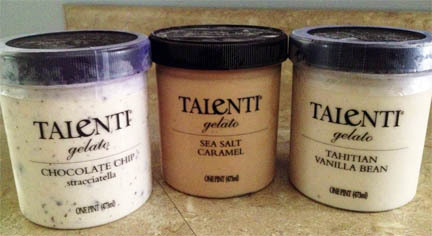 I’m loving Talenti most of their flavors are gluten-free! 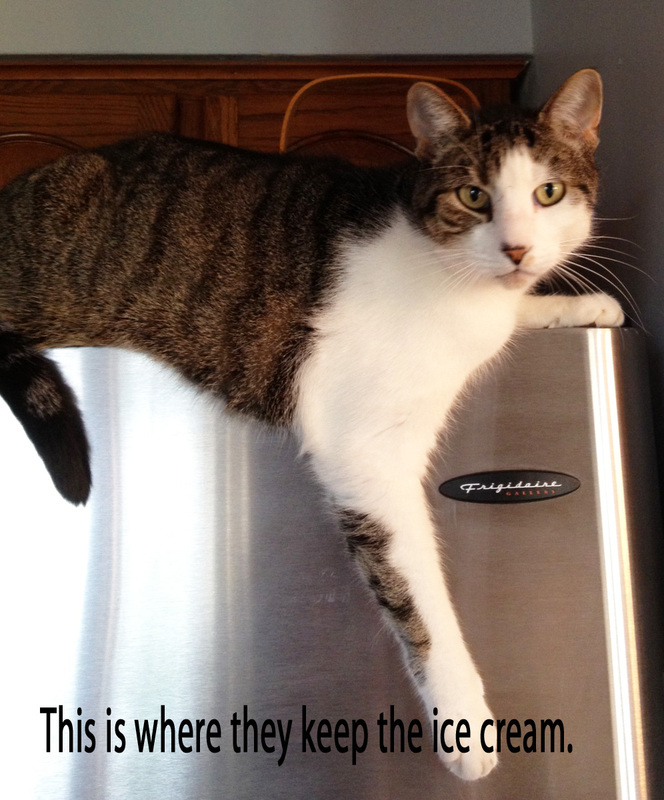 Sometimes I have to tell Wendell it’s not his. So go get a scoop and celebrate National Ice Cream Day–just don’t tell Wendell what day it is. *** Yes, I know it’s gelato and not ice cream but it tastes like it to me. 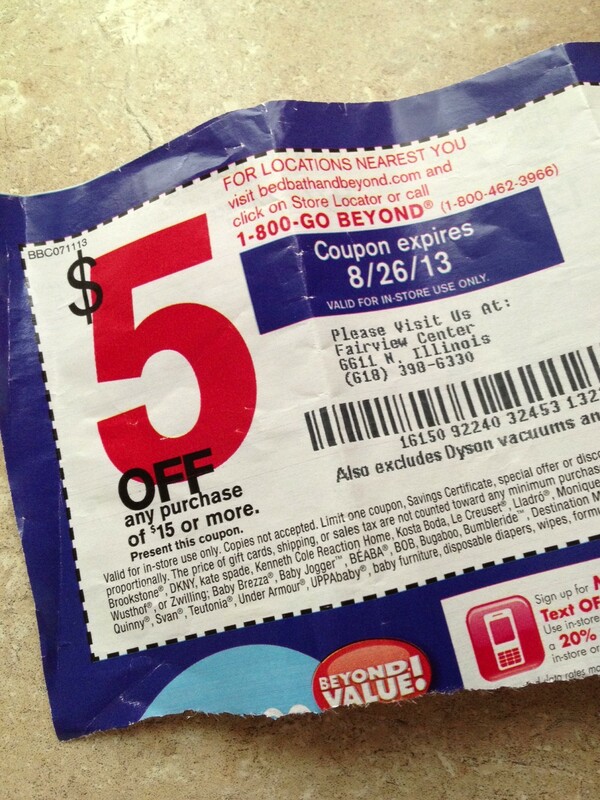 Can a Coupon Lure You? As I’ve mentioned in other places on this blog we are following the Dave Ramsey Financial Peace way of life. Sometimes it hard…no wait, it’s hard all the time! I’ve had this desire to purchase a tortilla press for quite some time. I’ve wanted really good tortillas and they have to be gluten-free. I have a recipe for them but not a press. Making tortillas is supposed to be easy especially if you press them. So I haven’t tried making them since I don’t have the press. Are you following this logic? Ha! So when the $5.00 off $15.00 coupon from Bed, Bath and Beyond arrived I knew it was time to get that tortilla press. It’s been awhile since I’ve been inside this mega wonder store. My favorite place is at the front where all the organizing items are located. 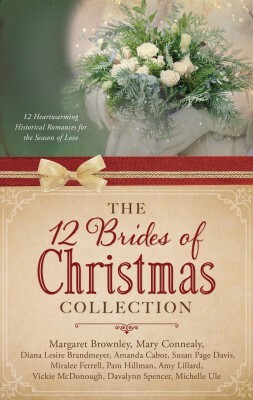 I touched, pulled things out and marveled at all I’ve missed while on my shopping hiatus. Then back to what I came for –the tortilla press. They don’t have them in the store. Now what to do? I had a perfectly good coupon for $5. that’s like a five dollar bill in my hand, right? I continued through the store searching, hunting and even digging through the clearance shelves. I was transfixed by monitors showing me a new way to curl and straighten my hair. Checked the price on that amazing tool–way over $15. Before leaving I thought I should go back to the organizing items because there had to be something I MUST OWN for five dollars less. And then it hit me. The coupon was a lure. The item I wanted wasn’t at the store. An item I wasn’t even sure I really wanted but rather desired. I’d like to say I handed the coupon to another shopper but I stuck it in my purse–just in case. Now, I need to find that recipe, try it and if we like it, order the tortilla press. Are you lured into mega stores by coupons? Have you fought back and won? or lost? 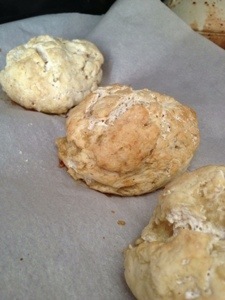 If you’re looking for gluten-free recipes follow me on Pintrest. If you haven’t signed up for my newsletter would you consider do so now? Thanks!